Last year there was warm feedback around the series of workshops on the different layers and aspects of love. Because of the feedback I will run the series again over the coming months of 2019. And yet out of love, we in the present, may become entangled or identify unknowingly with family members or events in past generations. 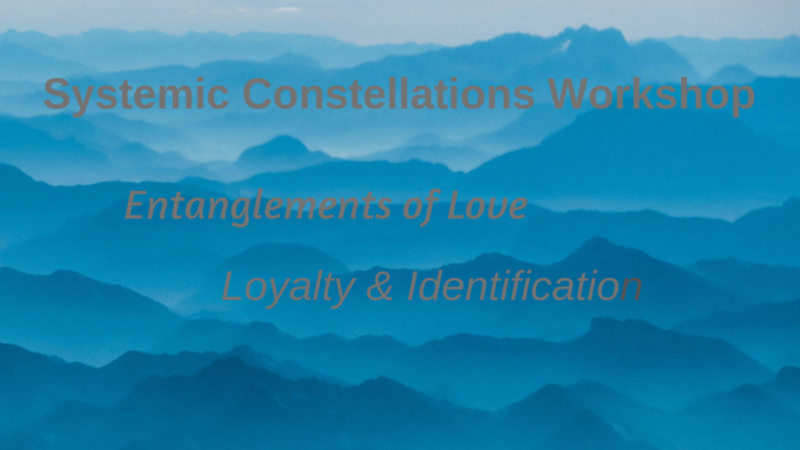 This upcoming workshop will offer a space for us to step into this core area of constellations work. These bonds of loyalty and love or identification are unconscious ties, or as Bert Hellinger would say, entanglements, that bind individuals to the family system and distort the balance and flow of energy within the family. Out of love, blind love and a deep need to belong, we become entangled in the lives of others and events of past generations. Come and join this one day workshop. Working this way (systemically, intuitively), with heightened awareness, with images, movement we will uncover these invisible hidden patterns and the generational histories of love. There are as usual, 4 places for those wanting to work on a personal issue by setting up a constellation. And many more places for representatives to attend. This February 23 workshop is 1 of 3 upcoming open workshops. This is important information for anyone who is wanting to book for the Deep Learning Groups that begin in June. The experience of at least 3 x 1-day workshops is required for entry into these Learning Groups. To end this post, here are some words about another sort of belonging – that of a sense of belonging to a community. The story below offers an example of the complexity of many overlapping systems and ways of feeling embraced (or not), into a community, of how this feeling of belonging can change a community and have an impact on individual lives, as the systems within systems, changes and shifts. And the link that finishes this newsletter is one that describes the process of change and how to stay with the movements contained in this shifting, moving process of changing. The Politics of Belonging is a story of how a sense of belonging grew in a community that was fragmented and stressed, with many of the social problems that accompany these conditions. Read about how the community embraced these layers of change, of what followed and of how the community and individuals were personally impacted. Begin to know the space between the old story and the new; the space of nothingness, of emptiness that is a place of resting before the movement that waits…. Until we meet within the work …….